Back in July I wrote a blog on my experience in delivering the Local Family Offer in Dorset. Last week, DWP published our evaluation report of the Local Family Offer, which brings together the insight gained from the Local Family Offer work, which has directly fed into the development of the Reducing Parental Conflict programme. The evaluation found that overall the pilot process was positively regarded, despite some minor areas of improvement. Coaching was generally well received, the pilot raised the profile of relationship support, and the provision developed was felt to be sustainable. Common themes in the provision developed included workforce development and culture change, and delivery of relationship services or programmes. This month DWP is opening applications for a new Reducing Parental Conflict Challenge Fund. The fund will allocate £2.7 million to innovative projects aimed at reducing parental conflict – this is for digital projects and projects which support families facing particular disadvantages, such as those considered to be ‘Children in Need’, or those living in families where parents have physical or mental health problems. DWP has partnered with Ecorys UK and Family Lives to launch the Reducing Parental Conflict Challenge Fund and is looking for projects to run from April 2019 until March 2020. As Assistant Director of Children’s Services at Dorset County Council, I saw first-hand how deeply families can be affected by disadvantages – such as poor mental health, worklessness or low income, and substance abuse. And we also know that where parental conflict is frequent, intense and poorly resolved, it can damage child outcomes. Parental conflict, which can include a lack of warmth and emotional distance, as well as arguments and verbal abuse can, and does, affect anyone (in 2015-16, more than 1 in 10 children with parents who live in the same household are thought to have experienced damaging parental conflict) but families who face other disadvantages can find themselves even more at risk. DWP’s Reducing Parental Conflict programme is starting to address this issue. We’re increasing access to evidence-based interventions locally and helping local authorities across England to upskill their workers to tackle parental conflict wherever it occurs. Our joint work with the Department of Health and Social Care and Public Health England is already funding work with parents who are alcohol-dependent and experiencing parental conflict. But we want to do more to encourage innovation in addressing parental conflict – which is why £1.1 million of funding from the new Reducing Parental Conflict Challenge Fund will be used to support innovative projects to help disadvantaged families to reduce parental conflict. Projects under the disadvantaged families side of the fund might include innovation to promote better integration or join-up of local services, or targeted interventions for families. 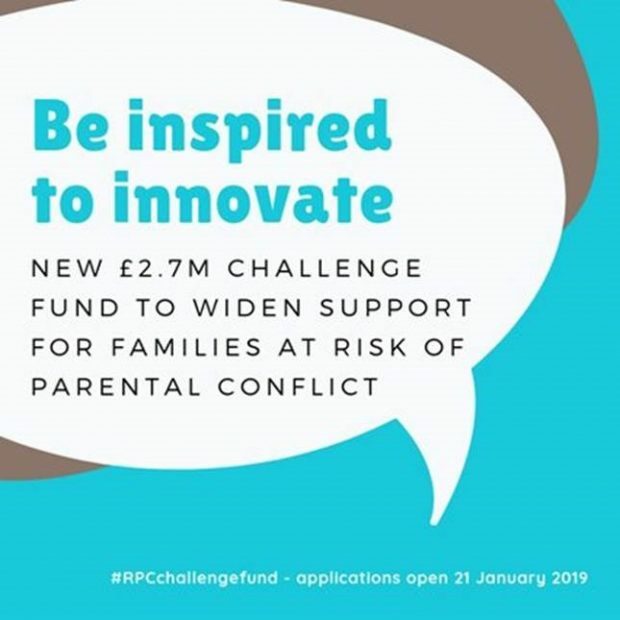 As well as providing support for the most disadvantaged families to address parental conflict, we also want to support applicants to the Reducing Parental Conflict Challenge Fund to develop innovative digital solutions to help parents to address conflict. We do more digitally than ever before, and the Government has recognised the need to provide more vital services digitally – to help more people to access the support they need, at the time they need it. However, we know that what is already out there doesn’t always work for those disadvantaged families most at risk of experiencing parental conflict. This is why we want to know more about what works to help engage these families online. To help us to gather this learning we are dedicating £1.6 million of funding for innovative projects to provide digital support to families experiencing parental conflict. Ideas for innovative approaches to address parental conflict could come from anywhere, which is why we are encouraging organisations across the private, public and voluntary sector to tell us their ideas on how to reach and support the most disadvantaged in our communities through this fund. Potential applicants can register their interest from 11 January 2019 and apply between 21 January and 15 February 2019. If you’re interested in developing an innovative approach to address parental conflict, and would like the opportunity to apply for funding for your project, please visit www.reducingparentalconflictfund.co.uk to find out more.